Troma recently send us information that two of Troma's cult classic films, "The Toxic Avenger Part 2" and "Class of Nuke 'Em High II: Subhumanoid Meltdown" hits Blu-Ray for the very first time. 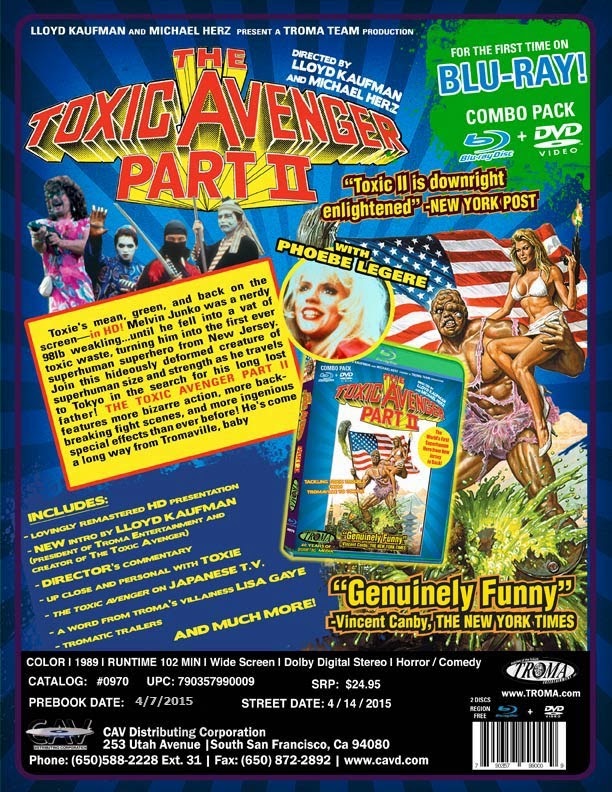 Special features on "The Toxic Avenger Part 2" includes Director's commentary, At home with Toxie, A word from villainess Lisa Gaye, Toxie on Japanese T.V., Troma Trailers and more. Special features on "Class of Nuke 'Em High II: Subhumanoid Meltdown" includes Audio Commentary, Music Video Trailer, Interview with Troma star Lisa Gaye, TroMoMA, Radiation March, Lunachicks 'Say What You Want', The American Cinematheque Honors 40 Years Of Troma, Mystery 'Return to Nuke 'Em High', Lloyd Kaufman Interviews James Gunn on the set of 'Guardians of the Galaxy'and Troma Trailers. "The Toxic Avenger Part 2" and "Class of Nuke 'Em High II: Subhumanoid Meltdown" hits Blu-Ray on April 14th.